Sofia Florez is a high school senior at Doral Academy. She has been a Girl Scout for 8 years and right now she is working on her Gold Award (highest award a Girl Scout can receive) with the Arthritis foundation. She wants to spread awareness and be of much help to the foundation as she can. Sofia is involved with the Arthritis community due to her mother having Rheumatoid Arthritis. Her mother began with the symptoms of RA at age 22. Ever since Sofia was born, she has seen her mother struggle and be in pain. When Sofia was a little girl, she would see all her friends with special braids and hairstyles that their mothers did them. Sofia knew that her mother couldn't do those hair styles so she learned to do them herself. Sofia never felt left out due to sometimes her mother's inability to do certain things other moms did with their daughters. Sofia and her mother have a strong and special relationship. Sofia believes that her mom is the toughest person there is. Her mom is her inspiration. To support Sofia, visit her team page - click here. Valeria is 11 years old and was diagnosed with Juvenile Rheumatoid Arthritis when she was 6 years old. Her symptoms first appeared in the summer 2013. She was complaining of joint pain on her knees and fever was on her little body for many days. Valeria was having a significant amount of morning stiffness mainly in her fingers, hands and feet. Having arthritis has affected Valeria’s life in many ways, and fatigue that comes with arthritis can be debilitating at times. Sadness and some tears for no reason appear sometimes. Stiffness is exacerbated in her hands affecting her while running, jumping, playing any sport. Fortunately, she practices swim and yoga regularly. Valeria is a great leader and an inspiration for all children with arthritis and their families. Valeria maintains a positive attitude and seeks to help others even though she herself suffers. She serves as a great example for all of us, and how we should treat others. Valeria has been a model in the Arthritis Foundation’s South Florida Magic of Caring Fashion Show. She has also attended the Juvenile Arthritis Camp and forms a team for the Walk to Cure Arthritis each year. 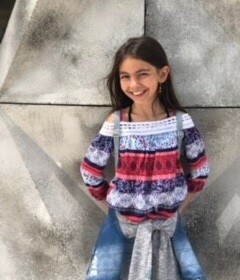 Valeria is excited to work with her school, Downtown Doral Charter Elementary School to raise awareness and funds to support the 300,000 children with arthritis and fund research for a cure to arthritis. To support Valeria, click here visit the Downtown Doral Charter Elementary School Team page.